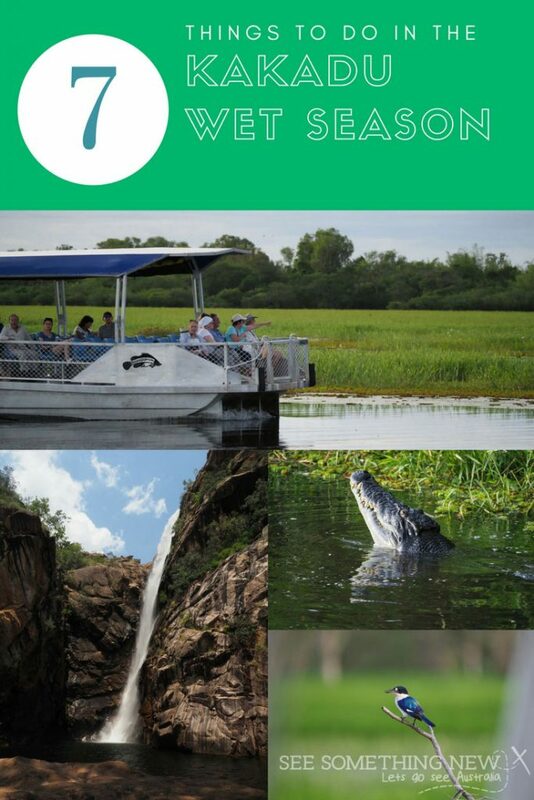 The ‘Wet Season’ in Kakadu runs from approximately November to mid May however no two wet seasons are the same. It is a unique time to visit the park where water is abundant and the landscapes are vibrant green – it’s a chance to see the park in a way very few visitors do! Iconic wetlands cruise takes you out to explore the tranquil Yellow Water Billabong and South Alligator River from a comfortable size boat. Cruising on Yellow Waters in the wet season will allow you to lookout over the floodplains in all their glory with huge amounts of water and lush green vegetation, a beautiful sight worth seeing all by itself. And while wildlife can be a little tricker to spot in the wet season (the animals can spread out and explore the floodplains), there’s still a very good chance you will spot birds like rainbow bee eaters and kingfishers and maybe even a resident croc or two. 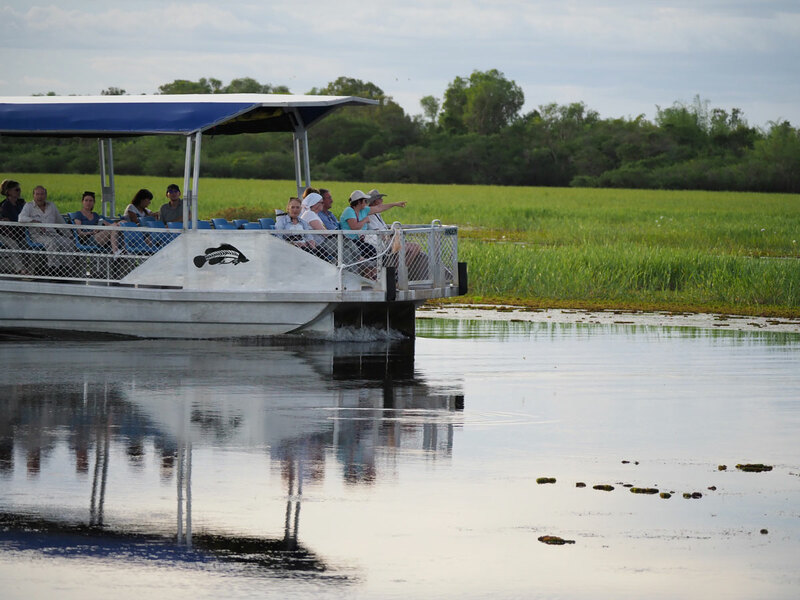 Hot Tip: Take advantage of the Kakadu Tourism ‘Cruise again’ special – book on a morning cruise and you can book in on a sunset cruise for around $25! 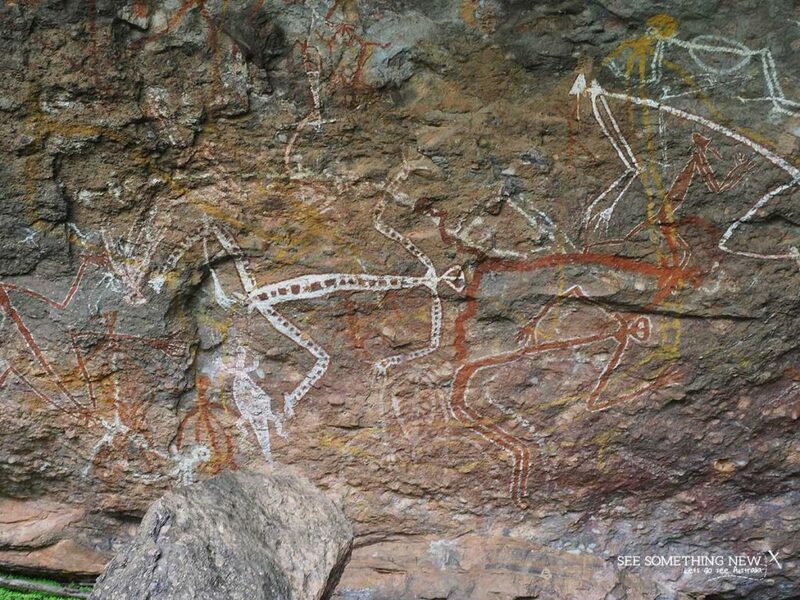 Beautiful art sites are easily accessible on the ‘Nourlangie’ walk which takes you to art sites in the area around Burrunggui and Anbangbang. Kakadu is World Heritage listed for its cultural values including being home to one of the longest living cultures in the world. There are a number of ways you can experience this culture in the wet season. Visit Nourlangie to see an ancient shelter used by Indigenous people for tens of thousands of years and enjoy some easily accessible art sites. There is a gallery of art on this walk that is also wheelchair accessible. Alternatively do the 4km return walk to the Nanguluwur Art site, a beautiful long gallery showcasing art ranging over a possible 20,000 year period or more! Visit the free Warradjan Cultural Centre which was developed by the Indigenous people in Kakadu to tell the story about their culture. The sunset on a cloudy night at Nawurlandja Lookout. Every sunset is different depending on the weather, the clouds and the time of year! Climb the steep but short walk to Nawurlandja lookout to watch the sun set on an epic Kakadu day. The sun sets behind you which means you look out over the Arnhem Land Escarpment and this hundred of km range sometimes changes colour as the last bit of sun disappears behind you so don’t leave to early. Some of the best sunsets in Kakadu are spotted from the roadside so keep your eye out if your driving home at that time (but watch out for wildlife)! Visit Ubirr on the Guluyambi Wet Season Tour & Cruise with Kakadu Cultural Tours, the only way to access the the iconic Ubirr Rock Complex in the wet season. A great tour for everyone and especially those short on time it includes a river cruise as well as the Ubirr Art site all in one tour. 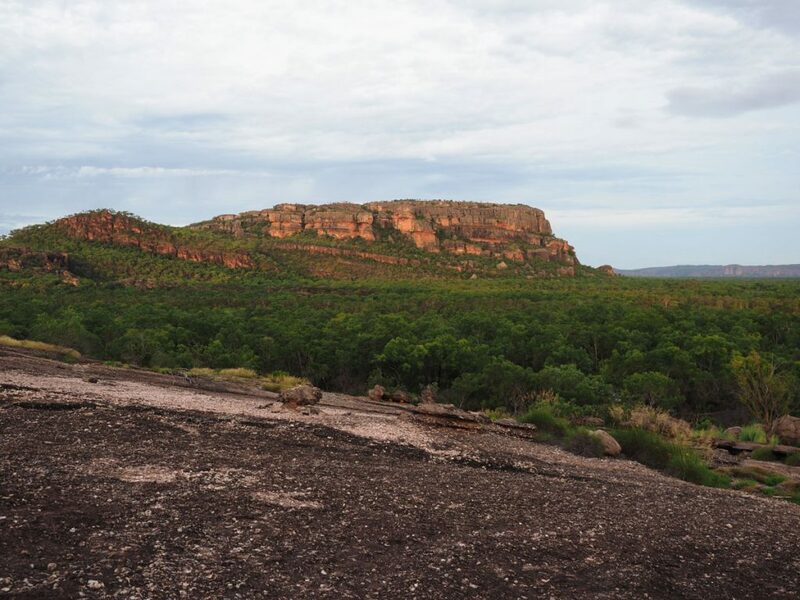 Kakadu Tourism also runs their Spirit of Kakadu Tours early and late in the wet season so if you like a more adventurous tour (sometimes 7 – 10km of walking and steep climbs) then this is the one for you. It hard to describe what a cool experience it is to see this hug 1.3 metre bird up close. WAIT, don’t skip ahead – even if you have never done a day of birdwatching in your life, there are some incredible birds to see in Kakadu National Park! You can spot them on the Yellow Water cruise, bushwalking and just driving around the park. There are raptors like Whistling Kites swooping over the park hunting for food and huge wading birds like Egrets and the 1.3 metre high Black Neck stork you can spot hunting for fish on the roadside floodplains! The creek bubbling through Monsoon Forest on the Gubara Pools walk which is 6km return. 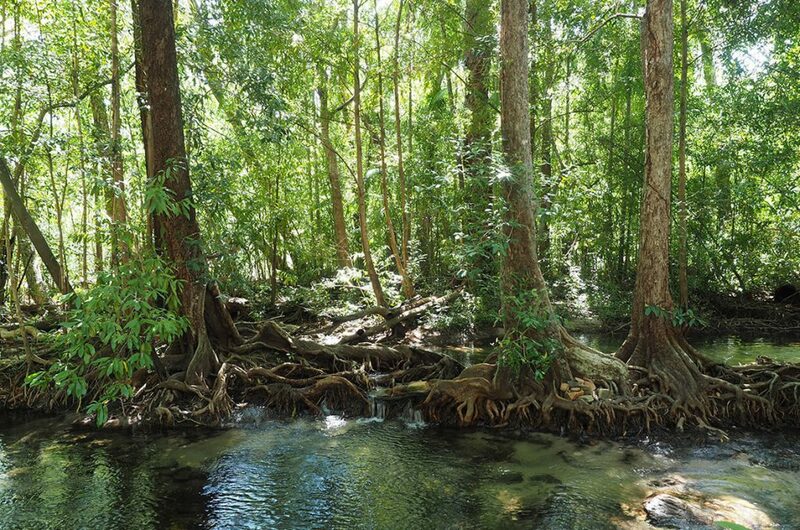 If your physically fit and enjoy bushwalking, Kakadu has a number of longer walks open in the majority of the wet season. Some walks may be ‘seasonally closed’ which generally means in they may close with intermittent flooding or in the middle of the wet season. Options include the 12km Barkk walk up into the sandstone escarpment and the 6km return walk to pretty Gubara pools in the Nourlangie Region. 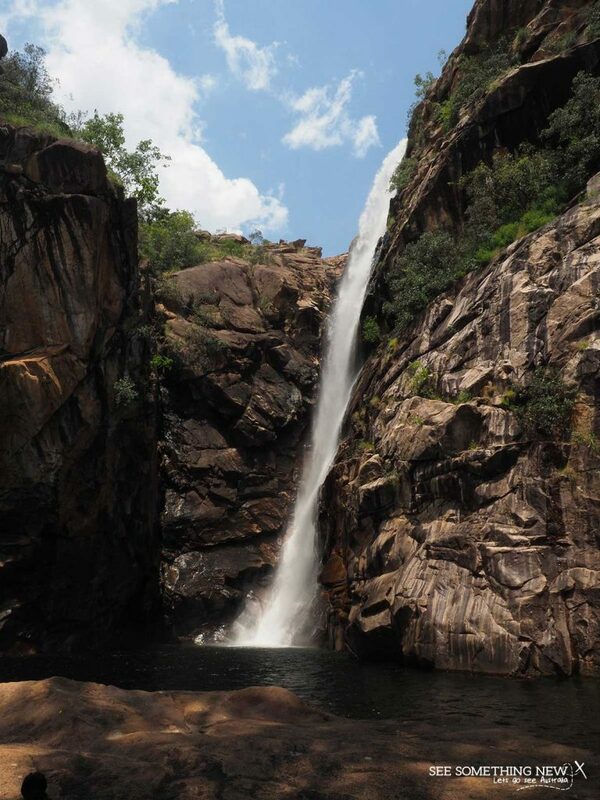 Alternatively there is the 7.5km motor car falls walk and 11km Kurrundie Creek walk in the Yumikmik region. Always check with the visitors centre for permit and seasonal access requirements prior to doing these walks. Splash out on a scenic flight to see Kakadu from a totally different perspective. When you fly over the park in wet season you see water pounding over the largest waterfalls in Kakadu as well as the flooded billabongs and plains. I haven’t actually tried this one because i’m not a great flyer but I’ve spoken to hundreds of people who did the flight and loved it! Should you visit in Wet Season? Wet season is a good time to visit if you have already seen the park in the dry and would like to see how it changes. It can also make the holiday a more affordable budget option as the wet season rates are much cheaper. If your visiting from overseas you will find it tricky to balance the perfect weather all over Australia and you may decide to visit Australia in summer for the nice weather in the southern states at places like the Great Ocean Road. However if you particularly want to walk in to see the bigger waterfalls, see sunset at Ubirr, and bushwalk and birdwatch at billabongs then don’t visit in the wet season. You need to come well into the dry when all the access roads and walks should be open to avoid disappointment. While there is no doubt there is more open to see in Kakadu in the dry season, wet season is a very unique time of year for long weekend away and a chance to see a side of Kakadu very few visitors witness! Visiting Kakadu between November and April? Pin this post to refer to on your holiday! Previous articleIs Fitzroy Island Queenslands most relaxed island resort? Hi Judy, thanks for the question! I know you’re visiting in August which is a busy time but there are a large number of caravan park and bush camping caravan accessible sites in the park so there is probably no rush yet. You actually can’t pre-book the parks run campsites (but there are some lovely bush sites for Caravans) and you can probably wait to you are sure of travel dates to book at the Caravan parks. Once you know dates you can always book it in to avoid missing out at your favourite caravan park. I am currently writing a post on choosing accommodation/camping in the park but basically it will explain about how large Kakadu is to drive around (several hours driving from one end to the other). For this reason, if you have extended time to explore Kakadu it’s a good idea to stay in a couple of different regions in the park (or even 3 or 4 if you have the time to explore). 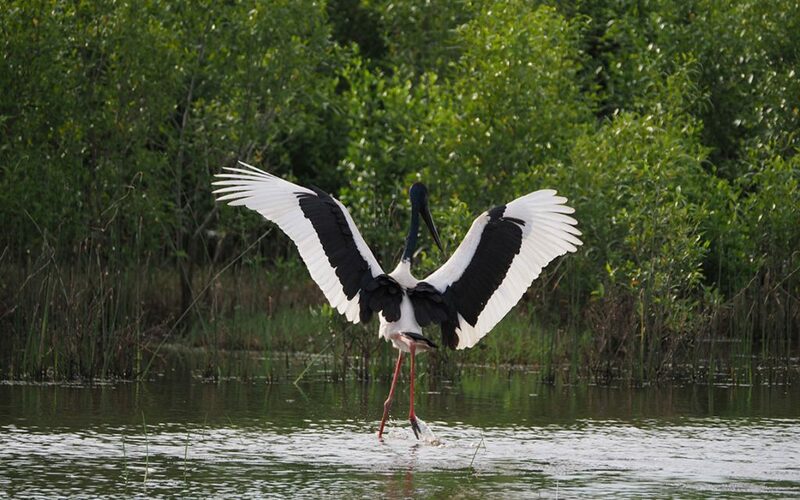 For instance if you are looking for powered sites Jabiru is a great base for exploring the East Alligator and South Alligator Regions (both less than 1 hours drive) as well as the Nourlangie Region (about 25 minutes drive). You could then continue 45 minutes south and stay in the Cooinda area as a base for exploring the Jim Jim Falls & Twin Falls Region (with a 4WD), the Mary River Region (different to Mary River National Park) and the Yellow Waters Region. It’s also a good idea to stay here the night of a Yellow Waters sunset cruise or the night before a sunrise cruise. Then you can avoid driving in the dark! Yellow Waters cruises can book out on busy days much closer to the date so you may like to book in your campsite and cruise for this portion of the trip before you arrive in the park.